Lennart Torstenson’s military campaign in 1642. In 1643 Christian IV of Denmark contemplated re-entering the German war, this time in alliance with the Habsburgs. As that would seriously jeopardize the Swedish strategic position Oxenstierna decided to pre-empt: he recalled Lennart Torstensson and the main Swedish Army from Moravia and sent them into Jutland (December 22, 1643). The Danes fell back, as was their usual military practice under Christian, and Jutland fell to the Swedes. In addition, Swedish and Dutch warships pounded and threatened Danish coastal towns and the Dutch and Swedes defied the Sound Tolls. Christian agreed to an armistice in November 1644, and a humiliating peace at Br_omsebro (1645). He lost Gotland, O” sel, and the bishoprics of Verden and Bremen. The losses were confirmed in the Peace of Westphalia in 1648. Swedish Field Marshal Lennart Torstensson besieged Leipzig with 20,000 men, intent on pushing Saxony out of the Thirty Years’ War (1618-1648). Arrival of a larger Imperial force, under Archduke Leopold Wilhelm, brother of Ferdinand III, and Piccolomini, lifted the siege. Leopold then vigorously pursued Torstensson as he withdrew six miles to Breitenfeld. The battle began with an Imperial artillery bombardment intended to cover a cavalry charge on the left. But the Swedish cavalry did not wait to be killed by whirling chain or solid shot: it charged, catching the Imperial horse in the flank. As Leopold’s cavalry fled in broken disorder, Torstensson wheeled left to attack enemy infantry pressing hard on the Swedish infantry at the center. These Imperials also wilted, leaving only cavalry on Leopold’s right and that, too, was soon engulfed by the Swedes. Those Imperial troops who did not die or fall wounded, or spur their horses to flight, soon surrendered. About 5,000 Imperials were killed and an equal number taken prisoner. Swedish losses were light. Imperial fortunes never recovered from this defeat, the military nadir for the Habsburg cause in the Thirty Years’ War. Swedish artillery general, then field marshal. A companion of Gustavus Adolphus from youth, he served in the king’s wars in Livonia and Poland in the 1620s. He spent two years of military study in the Netherlands, 1624-1625, under Maurits of Nassau. He was closely involved in the reform and standardization of Swedish artillery by Gustavus. Torstensson accompanied the king into Germany in 1630 in command of the field artillery. His batteries fought exceedingly well at First Breitenfeld (1631). He provided a smoke screen that allowed the army to cross the River Lech under enemy fire at Rain (1632). 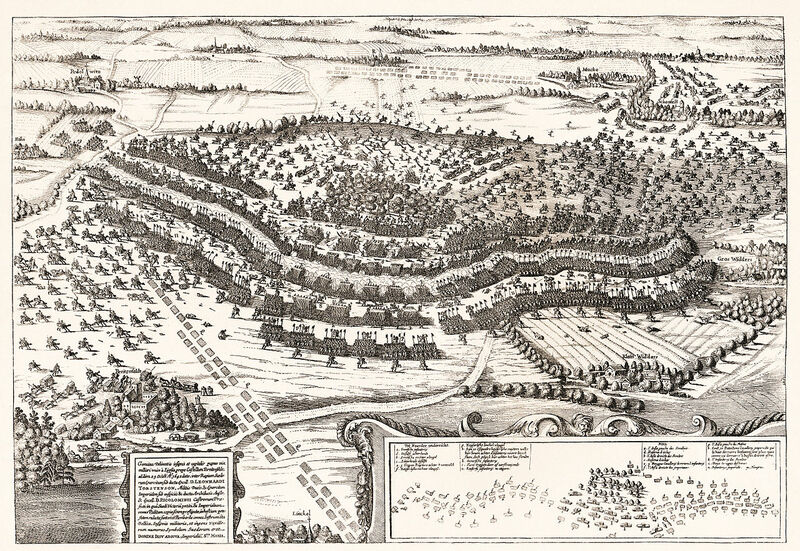 He was captured at Alte Feste (1632) during a failed attack on Albrecht von Wallenstein’s camp. He was held for a year then ransomed by Sweden and exchanged. He was subordinate to Johann Bane’r at Wittstock (October 4, 1636) but took full command of the Swedish Army at Second Breitenfeld (1642). 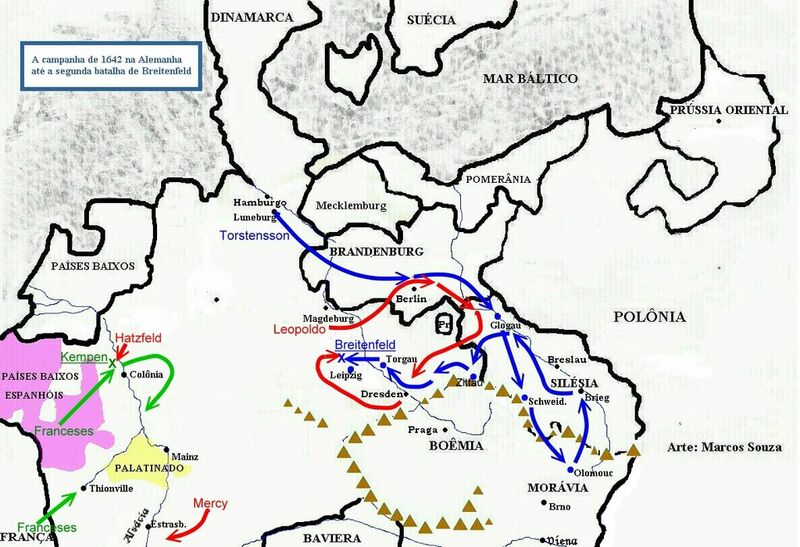 He spent most of 1642 overrunning Saxony, Bohemia, and Moravia. He marched the army across Germany in 1643 in order to invade Jutland in a pre-emptive campaign against Denmark sometimes called Torstensson’s War. In 1645 he moved against Prague, winning decisively at Jankov and knocking Bavaria out of the war but failing to take the well-defended city. His many years in the saddle took their toll: he resigned in ill-health in 1646 and died five years later. This entry was posted in Germany, History, Wargame by MSW. Bookmark the permalink.